The Tennant 5680 walk behind scrubber is built on the same platform as Tennant’s most popular selling scrubber- the Model 5700. 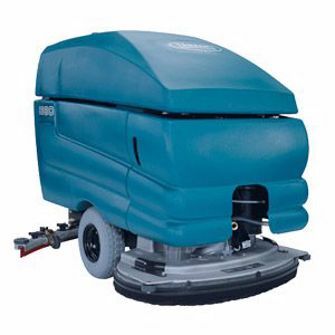 The 5680 was designed with rental companies and cleaning contractors in mind. Cleaning applications with ever changing operators will appreciate the simplicity and ease of use that this compact floor cleaning machine offers. Simplicity also means durability. This floor cleaning machine can handle the wear and tear from being moved from job site to job site with heavy-duty, daily use. Its powerful gear driven drive system allows it to easily climb ramps for maximum portability. Note: There is an updated version of the Tennant 5680, now called the Tennant T600/T600e. The Tennant 5680 shares all of the same attributes as the T600/T600e and 5700 when it comes to durability. The machine is made of components that will not rust. The electrical system is the best in the industry with all wiring wrapped in Kevlar and triple seal water tight connectors. Heavy duty motors and drives allow operators to do everything from stripping floors or removing coatings, to polishing concrete. The large equipment rental companies mostly chose the Tennant 5680/T600 for its durability and simplicity. After turning the key, running this scrubber is as easy as hitting the scrub switch and lowering the squeegee. The brushes do not turn until the operator twists the handles to propel the machine forward. The water does not flow to the brushes unless the machine is moving in scrub mode. The ergonomic design and easy to understand controls mean that operators can be trained in just a few minutes. If you are looking for an affordable floor scrubber that is simple to use with unmatched durability, consider this machine. Want to see it in action? Let us bring a Model T600/T600e out to your facility for a test drive. We'll have your operators scrubbing like experts and your floors cleaned like new in no time! Cylindrical brush in 700/28", 800/32" or 900/36"
Disk scrub brush in 700/28", 800/32" or 900/36"